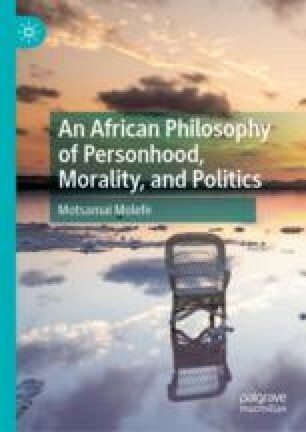 In this chapter, Molefe elaborates the idea of personhood as a moral theory. He conducts this discussion in a three-fold manner: Molefe begins by clarifying the relationship between being human and being a person; three such relationships are discussed. Next, he considers the agent-centred (character-based) nature of this moral theory. Two implications are drawn from the character-based nature of the discourse of personhood: (1) the meta-ethical view of humanism and (2) moral individualism. Finally, Molefe considers the role of social relationships in the moral discourse on personhood. He concludes by interpreting personhood to be a deontological egoistic perfectionist moral theory. Gyekye, K. (2010). African Ethics. In E. N. Zalta (Ed. ), The Stanford Encyclopedia of Philosophy. Retrieved from http://plato.stanford.edu/archives/fall2011/entries/african-ethics. Last accessed 16 January 2013. Wall, S. (2012). Perfectionism in Moral and Political Philosophy. In E. N. Zalta (Ed. ), The Stanford Encyclopaedia of Philosophy. Retrieved from http://plato.stanford.edu/archives/win2012/entries/perfectionism-moral/. Wingo, A. (2006). Akan Philosophy of the Person. In E. N. Zalta (Ed. ), The Stanford Encyclopedia of Philosophy. Retrieved from https://plato.stanford.edu/archives/sum2017/entries/akan-person/.